René Redzepi Roasts A Chicken At Home Or What Happens When I Don’t Turn Celsius Into Fahrenheit. Over the last two days, poor Nadine has had pneumonia, and she’s seven months pregnant. I’ve obviously had to take some time from the restaurant to care for her and our daughter and putter around our home kitchen. 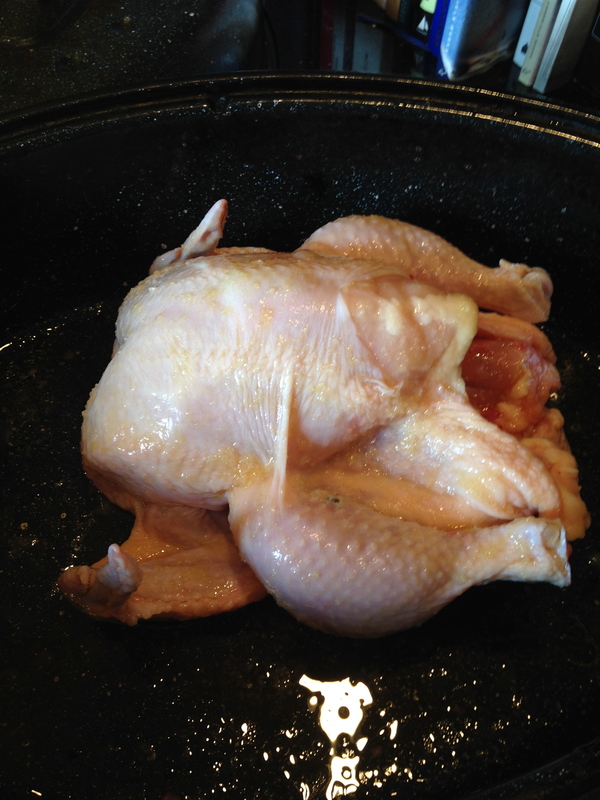 He decides to roast “a near-perfect chicken” and supplies his steps. Also, I don’t have a pregnant wife with pneumonia. Gabriela is healthy and assures me she is not pregnant. Still, I will carry out the recipe. I read more. I let it come to room temperature before rubbing in a little salt and oil, and then stuffed it with some of the halved citrus and fragrant thyme leaves, reserving that lovely sweet-scented yuzu peel. It went into the roasting pan with three heads of garlic, peeled, for one hour and fifteen minutes at 100 degrees celsius. It was a big chicken, dripping delicious chicken stock and lemon juice by the deciliter. Then, another half-hour at 200 degrees celsius, and finally fifteen minutes at 225 degrees celsius. So, I have my Bryan Farms chicken from a nearby farmer’s market. I’ll rub it with salt and olive oil. 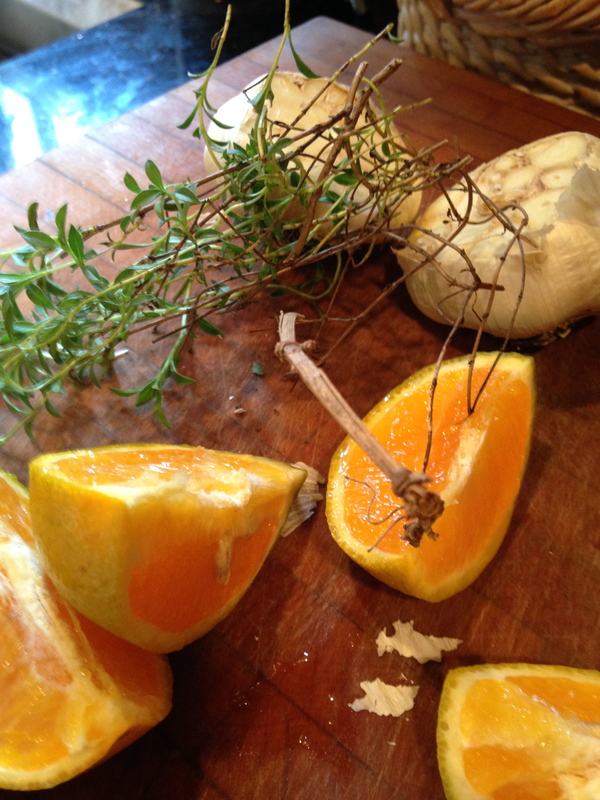 I’ve assembled valencia oranges (I don’t have yuzu, lemons or limes), fresh thyme leaves from our garden and two heads of garlic, not completely peeled, just the tops cut off. 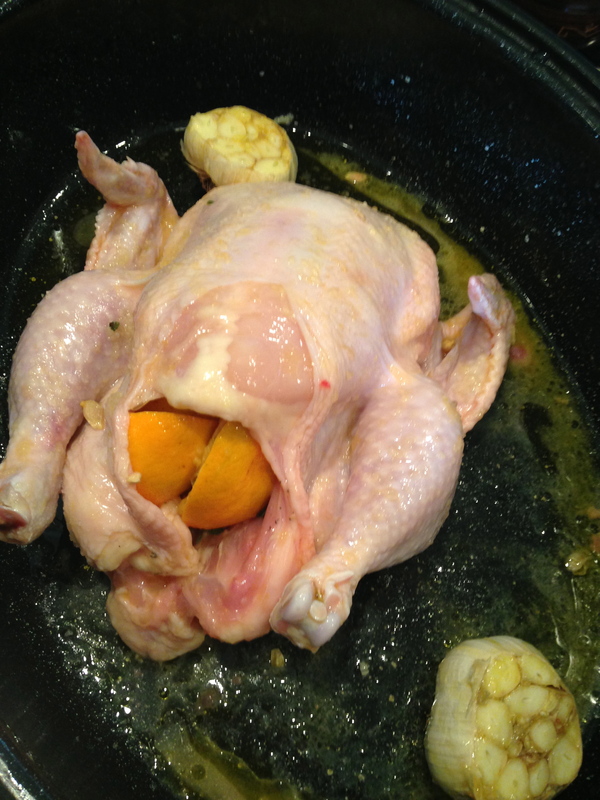 I stuff the chicken with the oranges and thyme leaves and place the garlic on either side of the bird. So it’s ready for the oven and here’s where it gets funny and possibly dangerous. I read 100 degrees fahrenheit, not 100 degrees celsius, and since my oven would only go down to 170 degrees fahrenheit that’s where I put it for one hour and fifteen minutes. Now, 100 degrees celsius is actually 212 degrees fahrenheit. Ha! But I haven’t realized that yet. So after an hour and fifteen minutes the bird is not that brown, and I’m still thinking fahrenheit, and he now calls for a half-hour at 200 degrees (which I’m reading as fahrenheit), and increasing to 200 degrees doesn’t seem like that much of a change, so I kick it up to 275 degrees. 200 celsius is equal to 392 degrees fahrenheit, but of course, I don’t realize that yet. Now, about fifteen minutes later, I decide to kick the oven up to 400 degrees and so it’s quite possible, I’ve actually caught up to where I should be, but then Redzepi has the chicken finish for fifteen minutes at 225 degrees celsius which is 437 degree fahrenheit. Ha! 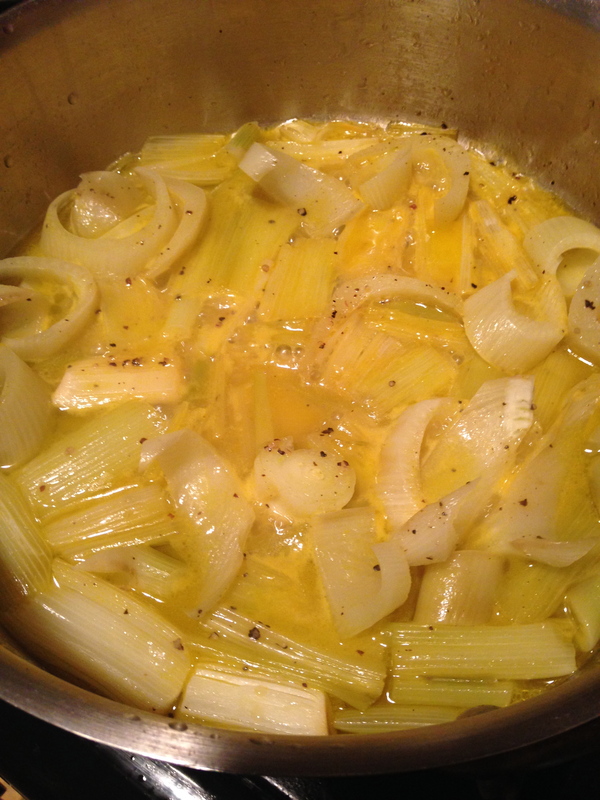 Along the way I’ve peeled and cut leeks and sliced up some fennel which I’ve braised in olive oil and fresh orange juice for half an hour. Everything appears ready so I pull the chicken out of the oven and let it rest. The test will come when I cut it apart. The lightly-roasted bird yields quite easily and is cooked through and through, though it doesn’t have that dark brown color I usually like, though I still don’t realize my mistake–that won’t occur until the following morning as I stare at Redzepi’s journal and let reality sink deep into my psyche. 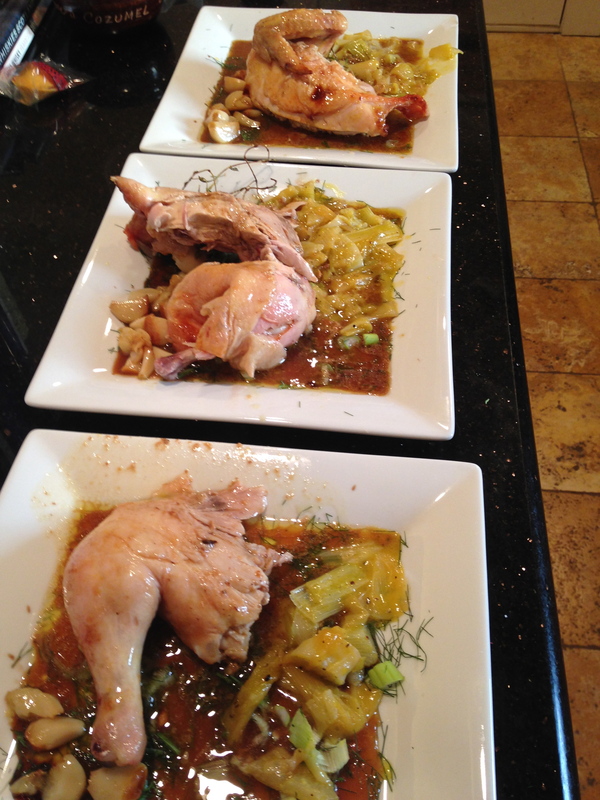 I plate the chicken with the braised leeks and fennel, roasted garlic, and the chicken drippings stirred with a chardonnay. Demian, Gabriela and I agree that chicken tastes like butter, sweet and soft in the mouth, and we clear our plates. I’m pleased and a little puzzled, and of course the next day, humbled so next time I’ll use the correct temperatures and end up with a more browned chicken. Ah, celsius. Bon Appétit.